Johnson Fleming will also be holding a quiz and a sweepstake on the day. 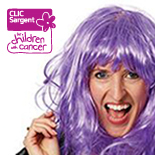 The organisation will be joining hundreds of people across the country who are being sponsored to wear wacky wigs for the annual fundraising event for CLIC Sargent. Funds raised from Wig Wednesday will go towards the charity’s work supporting children and young people aged 0–25 with cancer. It is also a chance for people to show support for those who may lose their hair through cancer treatment. Anna Finnegan, CLIC Sargent fundraising manager for the West Midlands, said: “Given the cutbacks and strains on NHS services, charity fundraising is playing an ever-more vital role in front-line services and Wig Wednesday is a fantastic means to raise those funds. Schools, businesses, communities and individuals are all invited to take part in Wig Wednesday. To find out more or to sign up, call 08451 212 492 or visit the website. Wig Wednesday 2015 is sponsored by MFS Investment Management and the official Wig Partner is party stockist Smiffys.